Sapa is most famous for its lush rice terraces that carpet the rolling lower slopes of the Hoàng Liên Mountains. The local hill tribes, such as the Hmong and Dao, reside here making their living as rice and corn farmers. 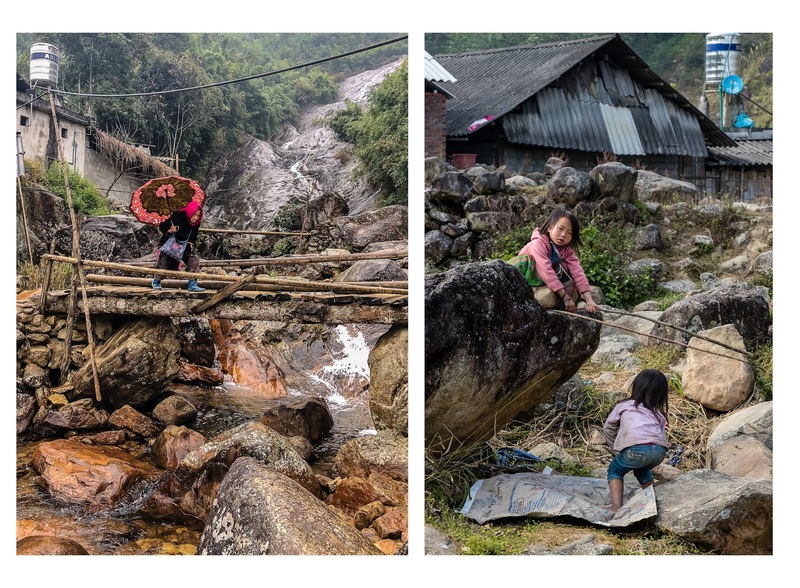 Our local guide, Chi, led our three day hike through the rolling rice terraces, waterfalls, mountains and hills of Sapa. The paths were at some points pretty difficult with many ups and downs made slippery with the rain. But the views! So very worth it. On the second night of our trek, Chi welcomed us into her home in the small village of Lao Chai. Her house was a very simple wooden two story home with basic amenities and an open fire in the kitchen which served both as a heat source for the home and a stove to cook. She and her husband were kind enough to cook us an extravagant meal after a long day of hiking. We even had to opportunity to attend a celebration honoring relatives that have since passed, which involved a drinking game that involved A LOT of rice wine. It was such a privilege to be able to observe their traditional lives in their village. Even though it wasn't as lush and green as we had seen in photographs - a downfall of going in the low season, we only ran into a few other tourists - a big plus! It was as if we had the whole place to ourselves. It was such a stunning part of Vietnam that we were so glad we got to experience. Special thanks to Chi, Rob, Fiona, Mitch, Angie, Ann and John for being wonderful hiking partners! You all made my time in Sapa truly memorable!